Campus Cooks provides on-site food service tailored to the needs of fraternities and sororities. With a distributed staff of over 150 seasonal chefs, regional supervisors, trainers, and salespeople, Campus Cooks tasked us with the challenge of ensuring their staff felt connected to the values of the company and had the tools to represent the brand at the most critical touch points — at every meal, account visit, and when the new chef arrived to set up the house kitchen at the start of each season. We started by developing a compelling brand story using our “Audience Hero’s Journey” model. We developed compelling parallel narratives directed at their core audience targets: student leaders, alumni, and house managers. 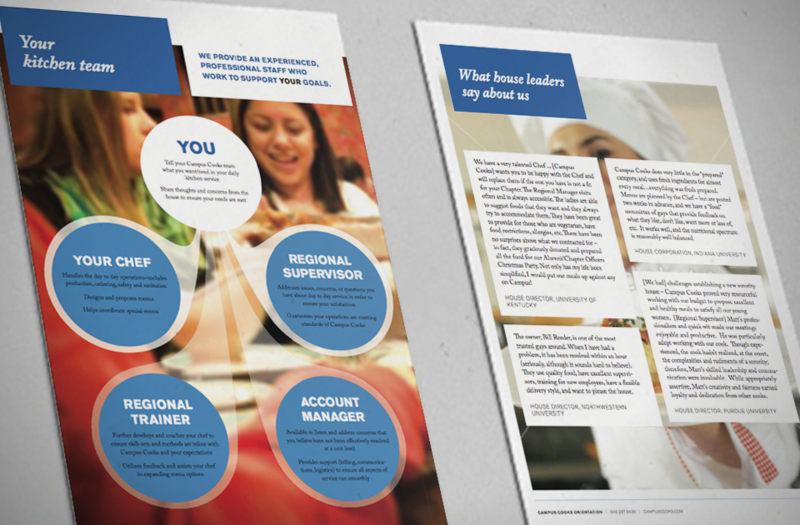 We delivered the Campus Cooks story as a piece of training collateral, arming each member of the team with language, common values and goals, and customer service scenarios. We developed and implemented a Facebook-style private company intranet, transforming the “chore” of daily meal reporting into a game-driven community of chefs and supervisors where recipes and safety tips are traded. 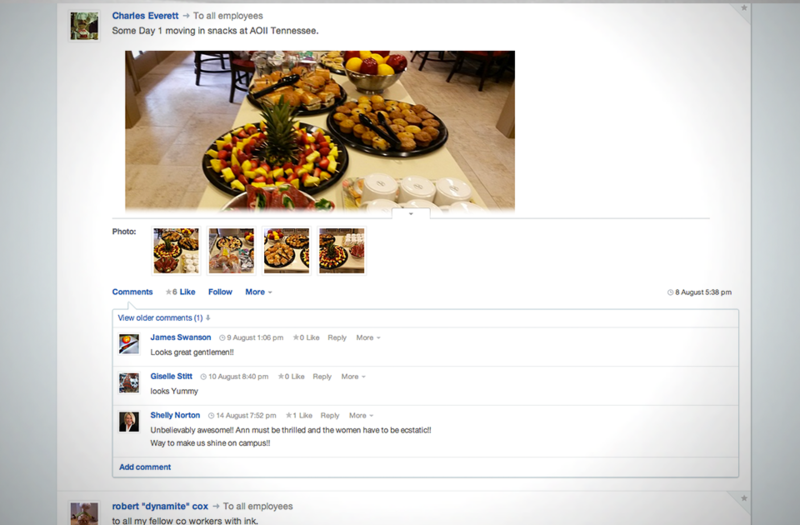 The effect on company morale was immediate and profound — chefs in Texas, Virginia and Illinois could share photos of their daily creations on their mobile phones and ask the entire team for help with complex account management situations, motivating the team and arming the central office with important documentation and a portfolio of original menus. For the sales team, we developed branded collateral that allowed them to show off both the talents of their chefs and their commitment to customer service. 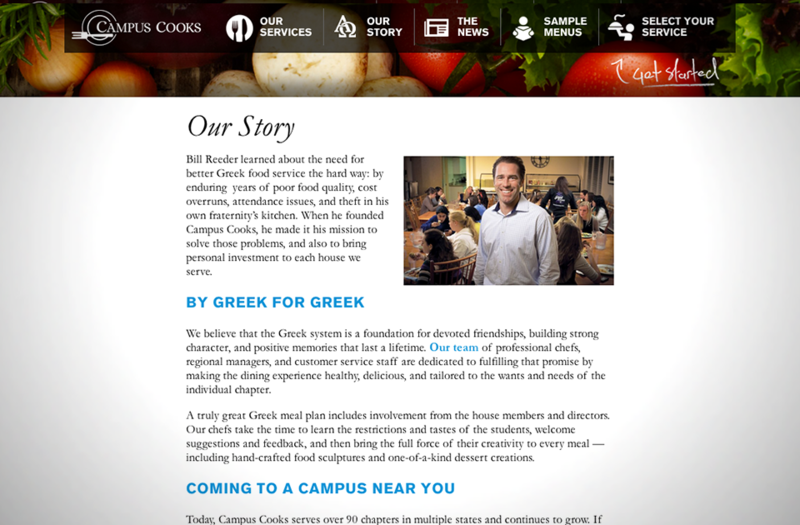 Finally, we remade the public face of CampusCooks.com, re-aligning their website with the newly articulated brand story and personality. 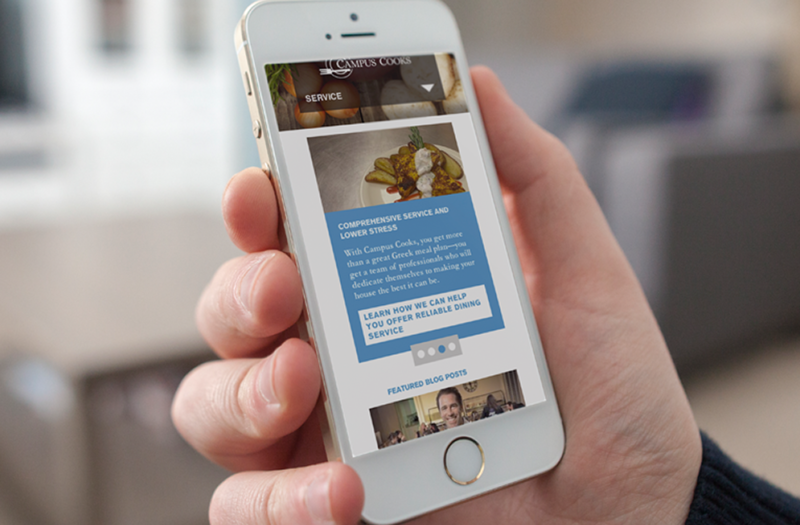 We designed the new mobile-responsive site on a customized WordPress installation, providing additional efficiency to their in-house social media coordinator to post news from specific houses across the country and share their growing portfolio of enticing menus.